A 3D eye scan allows us to see beneath the surface of the retina and is effectively an ultra sound scan of the eye. We are able to detect things that are not always visible in a retinal photo or with conventional methods. This was the case for one of our patients recently who presented with no problems or symptoms. The first picture (above) shows a retinal image which looks normal. However, when looking at the scan image (above, second photo) a haemorrhage was detected. This prompted an urgent referral to the hospital where the patient discovered that their blood pressure was dangerously high and resulted in a stay in hospital to lower the blood pressure and save their sight. 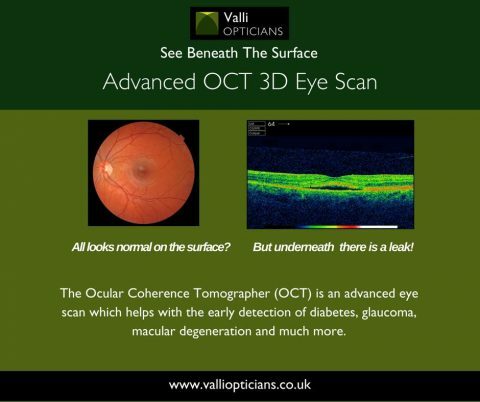 Using the 3D OCT our optometrists can take a digital photograph and a three dimensional cross sectional scan of the back of your eye in just one sitting. This allows us to instantly diagnose a number of common conditions. The scan is non-invasive, painless, simple and quick. What’s more, the software can automatically detect even the most subtle changes to the retina with every eye test you take. This gives you an invaluable on-going record of the health and condition of your eyes. Macular degeneration causes the gradual breakdown of the macular (the central portion of the eye). OCT cannot only identify this condition and its type (there are two types, wet and dry) but can also monitor its progress. Unfortunately, the risk of developing macular degeneration increases with age, and it is the most common cause of vision loss in individuals over the age of fifty. Glaucoma damages the optic nerve at the point where it leaves the eye. Recent statistics suggest that some forms of glaucoma, affect around 2 in every 100 people over the age of 40. The danger with chronic glaucoma is that there is no pain and your eyesight will seem to be unchanged however, your vision is being damaged. An OCT examination will confirm if you are at risk, or indeed what stage of glaucoma you may have. A macular hole is a small hole in the macular – the part of the retina which is responsible for our sharp, detailed, central vision. This is the vision we use when we are looking directly at things, when reading, sewing or using a computer. There are many causes of macular holes. One such cause is by vitreous detachment i.e when the jelly-like fluid, pulls away from the back of the eye and does not ‘let go’ which causes the retina to tear and a hole to appear. Extreme exposure to sunlight (for example staring at the sun during an eclipse) can also cause a macular hole to develop. As people get older, the jelly-like fluid that takes up the space in our eyeball can change. It becomes less firm and can move away from the back of the eye towards the centre. In some cases, parts do not detach and cause ‘pulling’ of the retinal surface. The danger of a vitreous detachment is that there is no pain and your eyesight will seem unchanged but the back of your eye may be become damaged. The OCT scan, means that you can enjoy the peace of mind that comes from knowing that your eyes are in great condition. Book your OCT 3D eye scan appointment.